Charles Elcock's building for the Daily Telegraph must have been seen as bold, modern and thrusting when it was built in 1928, an odd advertisement for a paper so conservative it is universally known as the Torygraph. The decorations on the main facade are conventional Art Deco, by Alfred Oakley.The pair of Mercuries over the front door distribute the news round the Empire and even to heathen foreigners, rushing away from Blighty on their winged boots as the sun rises round the globe. A rather arresting if cosmologically inexact image. Oakley probably also carved the charming and much more natural swallows. High above, right on top of the building, these two rather brutal masks stare out into the middle distance. They are called The Past (above) and The Future (below) and are the last major sculptures of Samuel Rabinovitch. Rabinovitch's first and only other major commission was for the West Wind on the London Underground building in Westminster. There, all the artists had carved their work directly, ie when the stone was in place rather than in a studio. However, at the Underground the initial shaping was done in the studio and only the finishing was done directly. At the Telegraph, Rabinovitch went the whole hog and carved the masks from block to finished work as a medieval mason would have done on a cathedral. Charles Elcock, the architect, apparently did not know exactly what he was up to until the scaffolding came down, which was trusting of him. According to Rabinovitch himself: "The stern, glum, emaciated face is that of the Past, hollowed by age...(while)...the beaming face is that of the Future - young, blank and fresh." Unfortunately Rabinovitch concluded shortly afterwards that he himself had no future in sculpture, and gave it up to become an all-in wrestler under the name Sam Rabin. 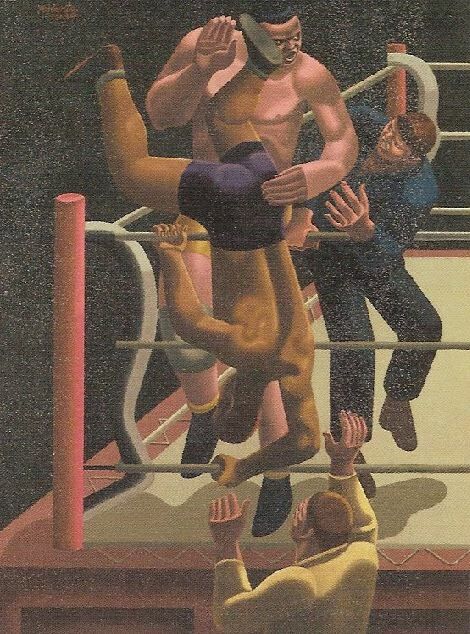 Here he is, depicted by artist William Roberts being thrown out of the ring by fellow grunt-game aficionado Black Eagle. I really like these faces. It is very interesting to see two abstact, deco styled sets of angel's wings. Level of simple detailing is very appropriate given the distance they are viewed at. But was it a surprise to the architect? Almost without exception these types of sculptures are first modeled in clay at a small scale as part of the standard artist selection and approval process. Rabinovitch himself said that the architect had given him a free hand, but would no doubt have known what the general idea was. In fact, apparently neither the architect nor the sculptor could see the work from the ground because of the scaffolding and the narrowness of Fleet Street, so the actual effect of the finished work was something of a surprise to both. I don't like the masks and I don't suppoose the good citizens of London liked the sculptures on the London Underground either. Both buildings were decorated during the 1928-30 era when Deco modernism and harshness were tough to look at. But Rabinovitch wasn't alone in Deco harshness, was he? Am I the only one thinking Rabinovitch might have read The Time Machine before coming up with these faces? In any case, the epilogue is hilarious.